We spend our days helping companies all over the country and world implement visitor management software, so we know a bit about the kind of company that it works the best for. Here’s the twist: It works the best for pretty much every kind of company. Businesses of all sizes, industry types, formality levels, and security levels get serious benefits from improving their visitor check-in process. They can benefit businesses with both high and low visitor traffic levels. We have satisfied clients with just a handful of employees in a small studio, and clients with dozens of workers in sprawling warehouses. Don’t just take our word for it. Here are five companies that have leveraged visitor management tools to treat their visitors right — and have improved their businesses and employee experiences in the process. At K-TECH, the visitor check-in process is just a little more serious (and a little more complicated) than it is at a “typical” business. That’s because K-TECH manufactures products for the military and space markets. Regulations require them to make a special effort to ensure that only the right people have access to these sensitive materials. Part of their security efforts include issuing an ID badge for each visitor and keeping records of who comes on site. They also verify each visitor’s U.S. citizenship to comply with federal regulations. Furthermore, like any other manufacturing facility, it’s important that K-TECH make sure that all visitors understand their responsibilities and all safety protocols before they come inside. Finally, they must keep clear records of all of their security efforts and checks to comply with potential audits. Complying with these regulations could lead to a cumbersome check-in process, but that hasn’t happened at K-TECH. They invested in The Receptionist for iPad, and have customized each check-in process for their needs. Now, visitor badges are printed automatically for visitors as soon as they’re finished checking in on the tablet-based system. And returning visitors can check in quickly using just their email address instead of starting the entire process fresh each time. Plus, visitors never have to wonder how long they’ll be waiting or if they were forgotten, because hosts get text messages as soon as they arrive. Read more about K-TECH’s visitor management system here. Chicago Compass Counseling specializes in serving achievement-oriented people who are struggling with alcohol consumption. 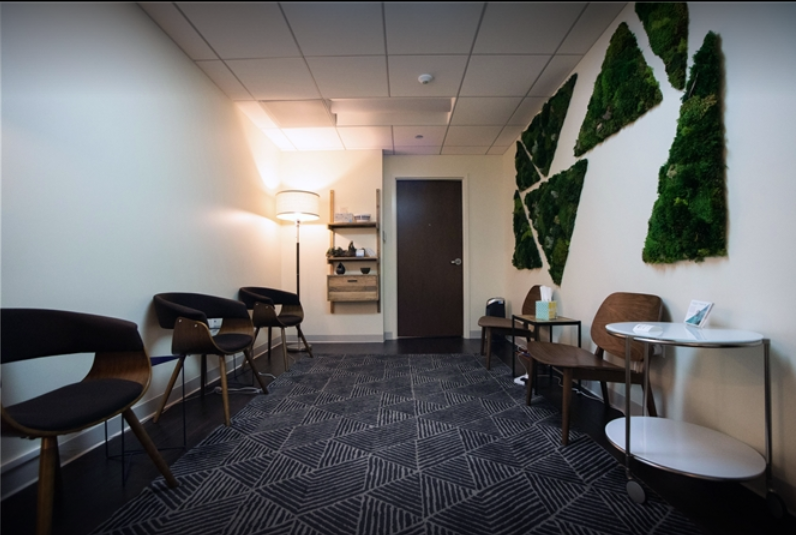 Their clients come to them because they’re looking for a more private alternative to the typical group counseling approach. Chicago Compass Counseling clients often have high-powered careers, and they don’t have flexibility in their schedules. They come to Chicago Compass Counseling specifically because they can get help confidentially and on their own schedule. Because of that, owner Sarah Suzuki made the smart decision to invest in The Receptionist for iPad. This check-in app helps keep visitor personal information completely confidential and aligns the visitor check-in experience with the high-touch, personalized service that its clients expect. Because visitors sign in on a tablet, they don’t have to worry about writing their name down on a pad of paper that other office visitors might see. They don’t even have to verbally confirm their personal details to a receptionist. Perhaps best of all, visitors never have to wonder whether or not their therapist is expecting them. Because therapists get notifications on their phones, they can chat with their visitors right away. At Chicago Compass Counseling, therapists also jump in and help one another out with their visitor needs as necessary. The Receptionist allows them to set up custom alerts that can ping other staff members by text, email, or Slack message if the visitor host doesn’t respond promptly. For more on Chicago Compass Counseling’s visitor management practices, click here. Clients focus on practices that enhance their minds and bodies. They can curate their own health experiences, choosing Pilates, Hatha and Vinyasa yoga, Tai Chi, meditations, and more. Contours provide a high-end experience, from its elite instructors to its top-of-the-line space. Founder Rana Jabbour knew that the check-in process also had to help put clients at ease and instill confidence. With The Receptionist for iPad, she was able to customize the way clients checked in exactly the way she wanted them to begin their wellness journey. Now, when Contours clients arrive, they begin by signing in with the iPad, and can select the service and instructor they’ve come along for. They can even sign any waivers as necessary, right on the same tablet as part of the check-in process. Staff receive notifications automatically, and Jabbour gets automated records of clients’ check-ins. For more on how Contours Studio uses The Receptionist, click here. In general, it’s fair to say that the world of accounting isn’t exactly known for being “cool” and “fun.” Firms that successfully project that vibe while still keeping things professional tend to stand out. MiddletonRaines+Zapata (MRZ) in Houston is one of these standout firms. MRZ has always been committed to being innovative, high energy, and entrepreneurial. That, in addition to their industry specializations and robust growth, was what has paved the way for MRZ to merge with Chicago-based advisory and accounting firm Baker Tilly. 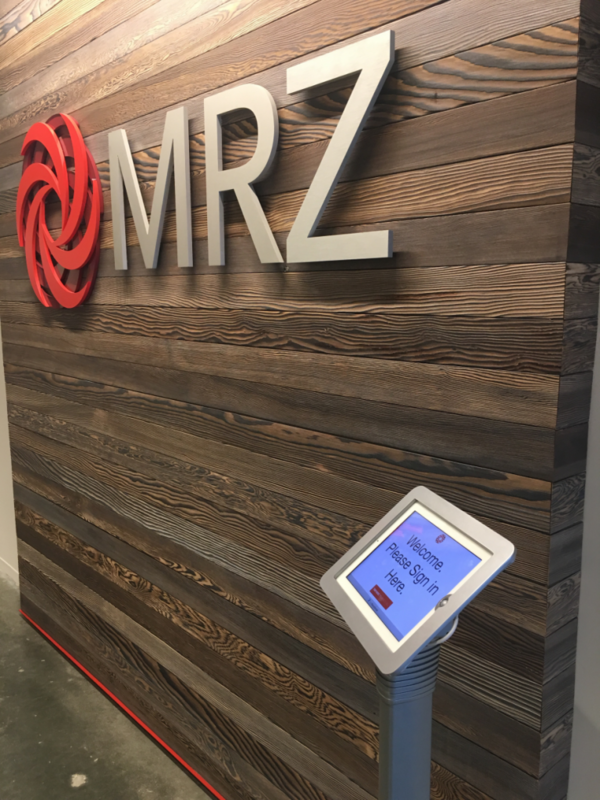 While almost every other accounting office still relies on live, full-time receptionist sitting behind the front desk, MRZ redesigned their office so that visitors enter at a common area instead of at a reception desk. MRZ noticed that their visitor traffic was going down, and that no one on staff relished the job of sitting in the visitor area. The Receptionist for iPad made it possible for them to remove a physical reception desk and use a tablet stand instead. The staff agrees that it gets the job done and adds a fun and personal touch to the check-in process. For more on this accounting firm’s visitor management practices, click here. Wakaya Perfection produces natural Ketogenic Lifestyle products, all sourced from the Fiji archipelago. This direct sales company gets plenty of visitors at its corporate offices and warehouse in Lindon, Utah. Distributors come regularly to pick up their orders from the warehouse, and other people come to the offices for corporate appointments and meetings. 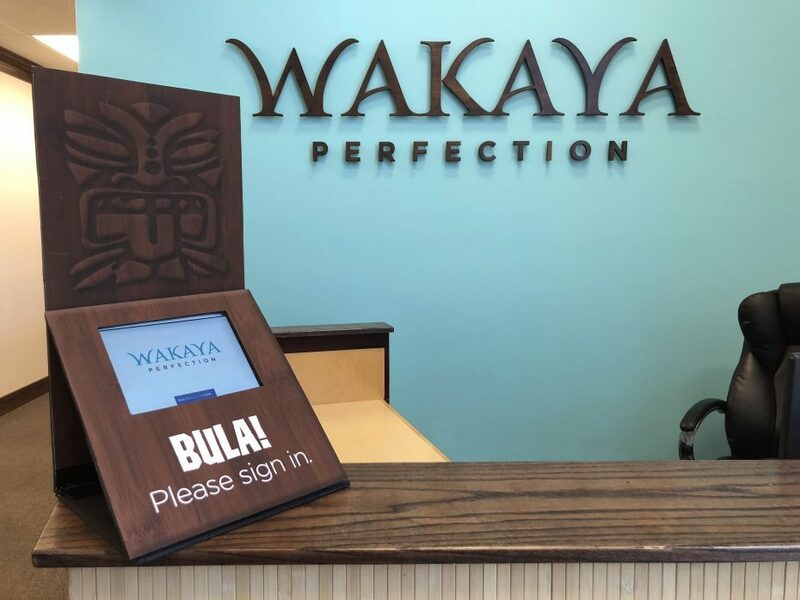 When the Wakaya Perfection staff made the upgrade from a paper visitor log to The Receptionist for iPad, they noticed a difference right away. Employees loved the fact that they could quickly get notified in real time when visitors arrived. Because employees can respond to visitors quickly regardless of their location within the building, they no longer feel pressured to stick around their offices or the front desk waiting for potential visitors. Read more about Wakaya Perfection’s use of The Receptionist here. Hopefully reading these examples of visitor management done right across these companies goes to show that no matter your size or mission, a proactive approach to visitors can have big benefits. Are you ready to see what benefits The Receptionist for iPad could have at your own company? Click here to get a personalized, no-obligation demo. We look forward to hearing from you! You don’t have to break the bank to make your building a lot more inviting.